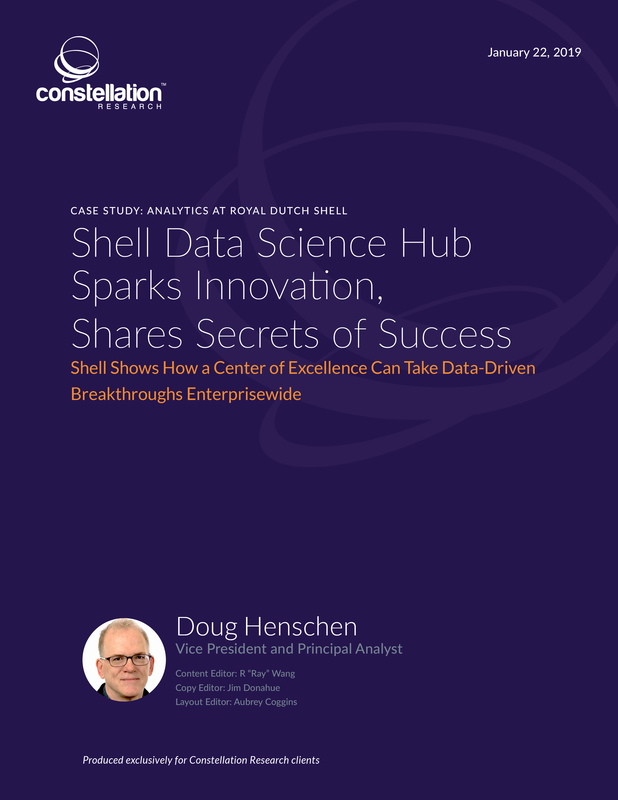 Shell Data Science Hub Sparks Innovation, Shares Secrets of Success | Constellation Research Inc.
Royal Dutch Shell (Shell) is a global energy company engaged in all aspects of oil and gas exploration, production, refining and marketing, and the manufacturing and marketing of chemicals. It’s also expanding into new energy businesses, focusing on new fuels and power. In 2017, Shell became the first international oil and gas company to introduce an ambition to reduce the net carbon footprint of the energy products it sells, expressed as a carbon intensity measure that accounts for the full life cycle of emissions. Shell aims to reduce its net carbon footprint by around 20 percent by 2035 and by around half by 2050. 1. Create a common technology platform for analytics. 2. Showcase and scale up innovations and best practices. 3. Create a network to help business units drive their own analytics breakthroughs in self-service fashion. Constellation sees a degree of centralization as essential to making the most of analytical innovation across an enterprise. This case study examines the hub-and-spoke structure and evolution of Shell’s COE, how it’s funded and how it facilitates innovation across the company. The report also details examples of successful projects. The report concludes with lessons learned and recommendations from Constellation Research based on multiple centralized data-innovation initiatives led by chief data officers and chief analytics officers.